The story of Narcissus comes from Greco-Roman mythology. 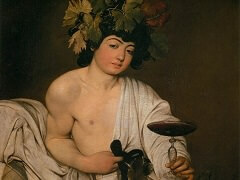 The most popular version is from Ovid's Metamorphosis 3.5, from which Caravaggio's interpretation is taken. Legend has it that Narcissus was the preternaturally beautiful son of the nymph Leiriope and the river god Cephissus. 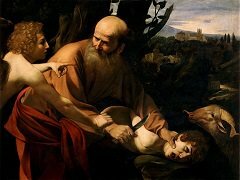 When Narcissus was still a young boy, his mother took him to the blind prophet, Tiresias, to have his fortune told. The blind prophet predicted that "If he but fails to recognize himself, a long life he may have, beneath the sun." that's pictured in the middle of the stream!" Narcissus stayed beside the stream gazing at his reflected paramour in vain, neglecting even to eat or drink. Upon his death, his body was transformed into a beautiful yellow flower, which still carries his name today. 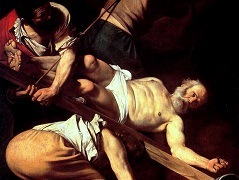 This work was produced during the middle of Caravaggio's career, a time that is not fully understood. 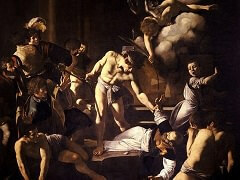 During this time, however, Caravaggio preferred a magical sense of atmosphere, suspense, and introspection. 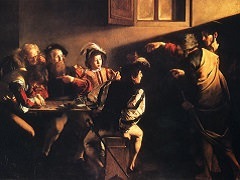 The influence of the Lombard style of Moretto and Savoldo were still profound and Caravaggio's experiments with light and shadow were evident. Caravaggio's early works are almost always set in a neutral, undefined space. The artist is also known for re-using the same models in his paintings. The boy shown here bears a remarkable resemblance to the angel in Rest on the Flight into Egypt. 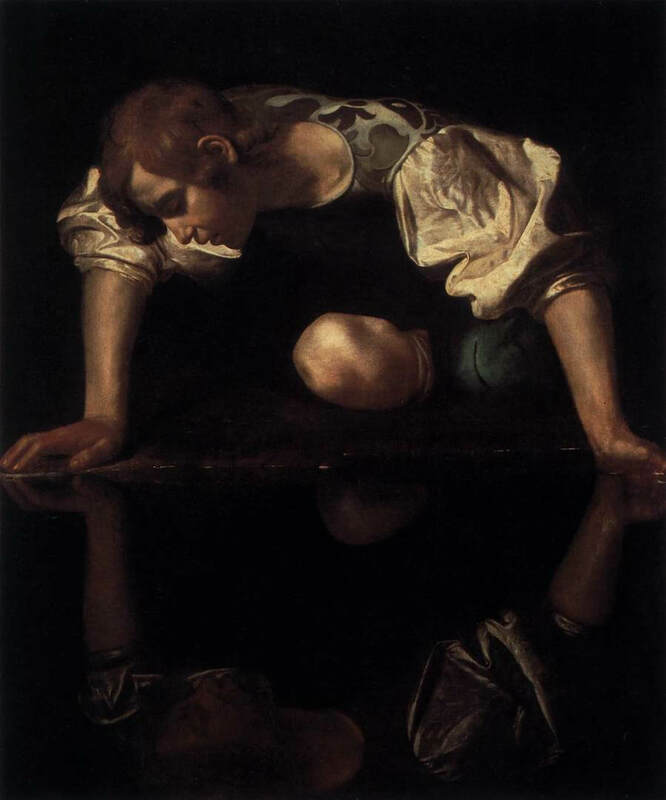 Narcissus is wearing a vest made of the same material as Mary Magdalene's dress in Caravaggio's The Penitent Magdalene. 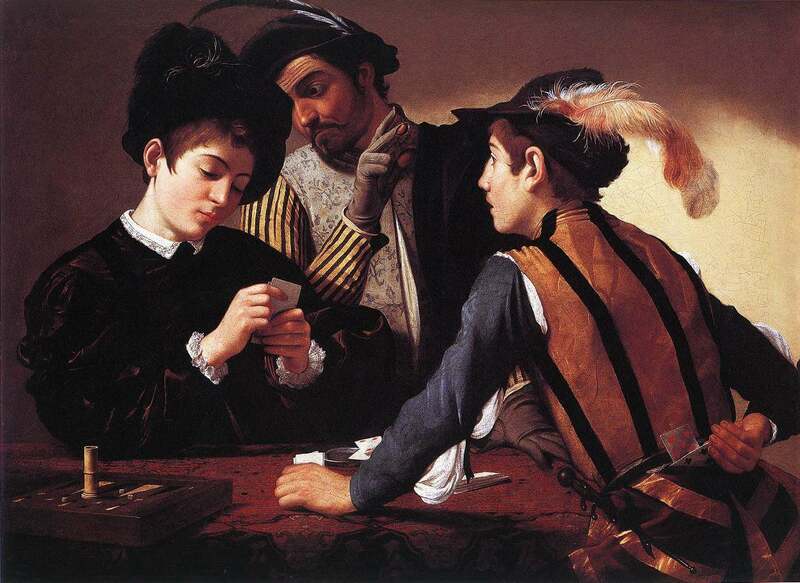 Especially while still a poor young artist, Caravaggio was known to reuse the same models and costumes in order to save money. 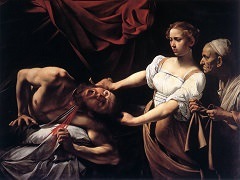 Caravaggio conveys a dark melancholy. Narcissus' eyes are deeply shadowed, his full lips voluptuous, and his yearning gaze is fixed on black water. This water was frequently associated by ancient writers with the waters of the Styx, and the narcissus into which the boy was transformed was associated with death, with Demeter and Persephone, with dank pools and funereal flowers.